Following regular club meetings in the spring and fall, tours are scheduled to members' gardens - learning from each other's gardening experiences and studying landscape design. A wonderful flowered path in a member’s garden. Spring time iris garden always a favorite tour for members. 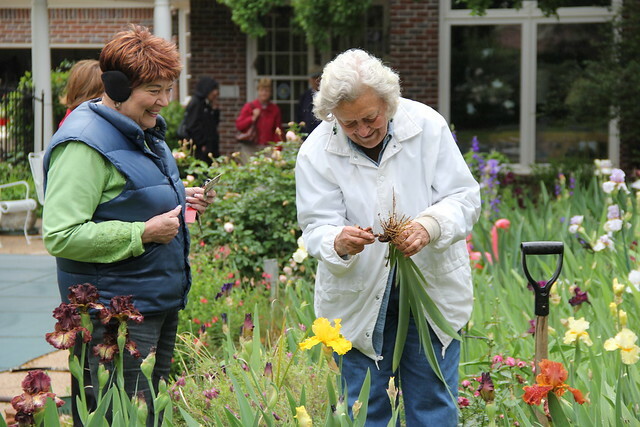 Tours for Gardeners on the Go are either within the local area taking most of a day, or at a greater distance with an overnight stay to explore gardens, nurseries, nature centers and wildlife refuges. Gardeners on the Go day trip to the University of North Texas for a Sustainability Tour. Gardeners on the Go overnight trip to Garvan Gardens and points beyond! More Grapevine Garden Club photos may be viewed online at our Flickr account. Just click on the SETS tab to look for specific tours or outings. To find the dates for future tours check the monthly activity lists in your GGC member Yearbook or website Calendar page. Then see the GGC monthly newsletters available on the Publications page for tour details and sign up instructions.